Back with Day 2 of my 25 Days of Christmas Card Series. 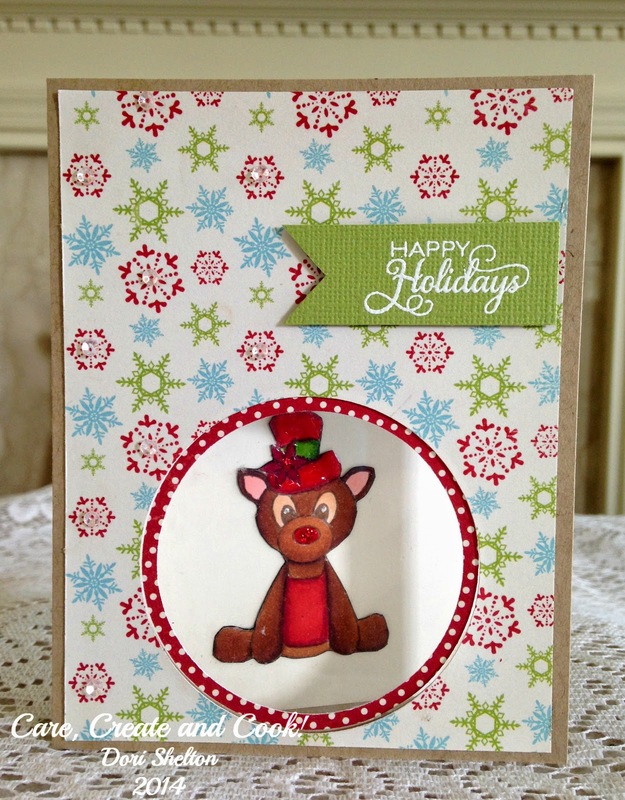 For this card, I wanted to create a window in the front of the card that showed the reindeer on the inside of the card. I cut a piece of kraft card stock to a standard size card and cut a 2 11/16 ciircle out of the front. Then I cut a piece of patterned paper a little less than the size of the front of the card and cut a circle that was slightly smaller than the one I cut from the card base. I cut a circle frame of red polka dot paper and laid that on the INSIDE of the card against the back of the patterned paper circle which showed through the base. This is why you cut the circle a little smaller. Finally, I cut a piece of acetate into a circle larger than card base circle and I adhered it to the inside of the card over the other circles. This is what makes your window. 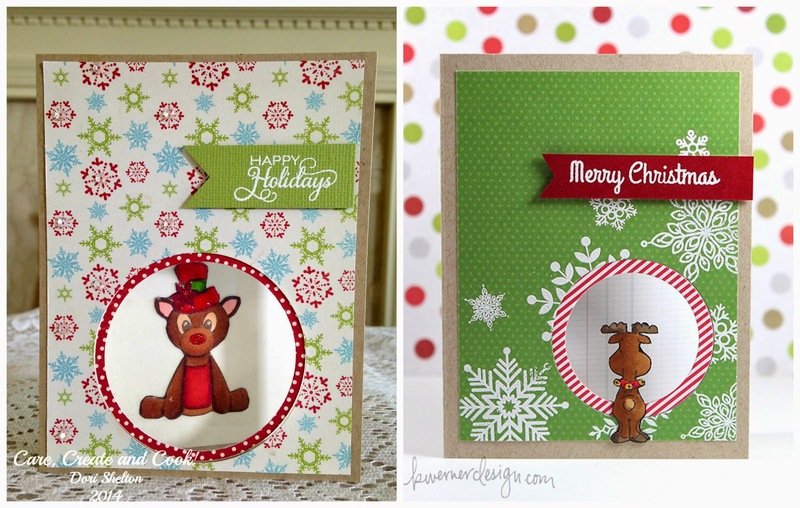 I covered the inside of the card with a piece of Vintage Cream card stock and then stamped the reindeer from Verve stamps, "Santa's little Helper" set and colored him in with Copic Markers. I added glossy accents to his hat, and red stickles to his nose and the poinsettia on his hat. I white embossed the sentiment onto a piece of green card stock and then finished the front of the card with some sequins in the snowflakes which I adhered using Ranger Multi Medium Matte. Here are the two cards side by side. Kristina used an "outside looking in" reindeer image; but I didn't have this one; but I think the one I chose made a good substitute.